Kyo-ryroi values seasonal ingredients just for the season! Kyo-ryori which is traditional dishes of Kyoto is one of the Japanese traditional cuisine called Washoku. Its origin is Daikyo-ryori, Shojin-ryori, Honzen-ryori, Cha-kaiseki and Kaiseki-ryori(see The origin and history of five Japanese traditional cuisine). People in Kyoto mixed them into Kyo-ryori. It is said that Kyo-ryori developed as local Kaiseki-ryori. Kyo-ryori developed along its own paths because of Kyoto's history and location. Kyoto was the capital city of Japan for about 1,000 years from 794. It flourished as the political, cultural and economical centre. People in Kyoto were influenced by various culture, culture of court noble, Samurai(Japanse warrior) and monks(priests). Because the Japanese ruler's status changed several times. A nobleman controled Japan until 1185, and Samurai controled Japan until 1868. Emperor controled Japan for decades among them. Monks controled some city of Japan, and resisted and fighted rulers by becoming Buddhist warrior called Sohei. They influenced not only people but also dishes in Kyoto. Kyoto forms a basin and is surrounded on three sides by mountains. Kyoto has not only harvest of mountaisn but also harvest of sea and river like Kamonogawa river. Kyoto gathered seafood from all over the Japan because it is capital city of Japan. Fisherman and trader devised methods for bringing them to Kyoto. Katsuobushi which is dried, fermented, and smoked skipjack tuna was brought to Kyoto for the emperor in 701. People in Kyoto improve their skills to cook them. In addition, the manufacturing industry of lacquer and ceramic ware in Kyoto. Because tea ceremony called Sado and flower arrangement called Kado valued teacup and flower stand made by lacquer and ceramic. 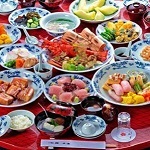 People in Kyoto also valued tableware, and selectively used tableware according to not only dishes but also the season. The point of Kyo-ryori is using seasonal foods and bringing out the flavor of the raw ingredients from them. Kyoto-ryori do that with Dashi which is a soup or soup stock made from Katsuobushi or dried kelp. In French cuisine, a chef makes a soup by boiling meat, bone and vegetables for a long time with removing a scum. On the other hand, a chef of Japanese cuisine makes a soup by Dashi in a short time. The feature of Japanese soup is that spending many days for making the source of Dashi instead of long cooking time. Katsuobushi takes at least a week to complete, some Katsuobushi called Hon-karebushi takes over two years to mature. Kyo-ryori uses various ingredients, vegetables, mashrooms, fishes(dried fishes), tofu(bean curd), tofu skin and fruits. Japanese tea and Sake of Kyoto also famous and used in a cooking. Especially, vegetables called Kyo-yasai or Kyoto vegetables supports and developed Kyo-ryori. They were brought from other area in the 8th century, and developed by improving of breeds in Kyoto. Nowadays, Kyo-yasai is known as one of the high-grade vegetables in Japan. However, customers can not eat every ingredients of Kyoto everytime because Kyo-ryroi values seasonal ingredients just for the season. Especially, vegetables and fishes are seasonal ingredients. In the spring, bamboo shots and edible wild plants called Sansai are delicious. Japanese Spanish mackerel and webfoot octopus are also delicious. In the summer, dagger-tooth pike conger called Hamo in Japanese is very delicious. The dish of it is one of the famous dishes of Kyo-ryori. Sweet fish also called ayu and eggplant are also necessity for the summer dish. In the Autumn, Matsutake mashroom is a major ingredient in Japan though it is expensive. It is also seasonal ingredient in Kyoto. It smells mellow fragrance by roasting. Chestnut and edible roots are Autumn's ingredients. In the winter, crab and fugu(blowfish) are major ingredients in Japan. The turnip of Kyo-yasai is often used in Kyo-ryori and is very delicious. Kyo-ryori's order is similar to Kaiseki-ryori because it derived from Kaiseki-ryori. 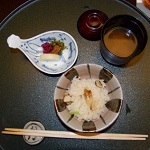 Kyo-ryori is a set meal, but some restaurants serve not only full course meal but also individual dishes(à la carte). In addition, the order of menu varies by restaurant. There are many restaurants to eat Kyo-ryori in Kyoto, but there are some restaurants to eat it in Tokyo and Osaka. Most of them are named Ryotei or Kappo. Ryotei is an exclusive Japanese restaurant. It serves Kyo-ryori in a Japanese style reception room with straw mat called tatami on the floor. Kappo serves it in a counter table. Some Kappo restaurants serve individual dishes. If you travel Japan, you can experience Japanese culture through Kyo-ryori. Note that a reservation is necessary for Ryotei and Kappo restaurants.